Send us your ideas for community projects! Members of the 2016-17 class (from left) Kate Brown, Teresa Smith, Kimberly Sombke and Matt Davis discuss their group project at the end of Community Issues Day. The team established a “sensory” garden at J.B. Stephens Elementary School, where Davis is principal. This year’s projects will be unveiled on Community Issues Day on Dec. 6. A key aspect of the Leadership Hancock County experience is the class members’ community projects. From designing the county flag to launching a campaign to build a “bark park,” class members over the years have honed their leadership and collaboration skills by working together on community issues. Leadership Hancock County is now seeking proposals from alumni, nonprofits and other civic groups for the community projects. Time is growing short for submissions: The deadline is Nov 17. 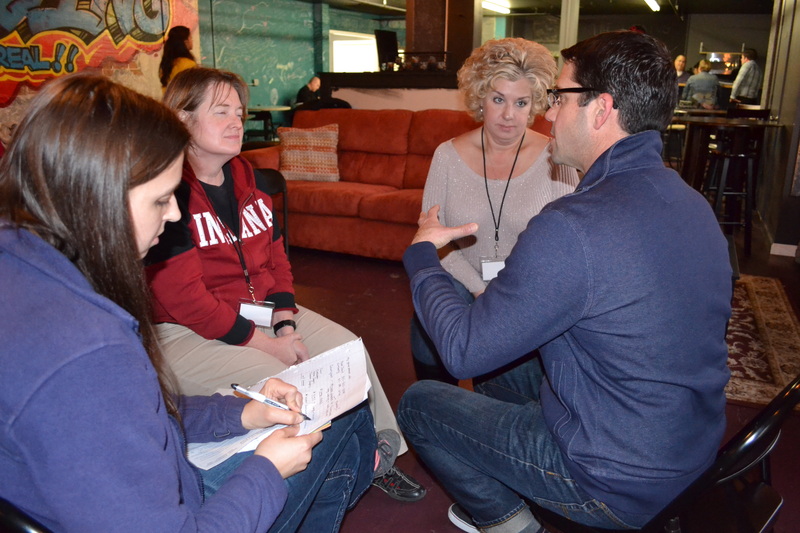 Each year, members of the LHC class form small groups and study a community issue or challenge. They make recommendations and submit reports as part of a public presentation at the class graduation in May. Projects from last year’s class included creation of a “sensory garden” at J.B. Stephens Elementary School; development of a website for The Landing Place, which helps people deal with destructive behaviors; and creation of a 5K run/walk for Alternatives Inc., an agency that advocates for victims of domestic violence and sexual assault. Since its inception in 1996, students have completed more than 60 community projects. A form to submit a community project idea is under the “Applications” tab in the menu at the top of our home page. Emails also can be sent to the LHC coordinator, Dave Hill, at info@leadhc.org. Leadership Hancock County’s latest class, which has 24 members, is meeting monthly. Projects will be unveiled on Community Issues Day on Dec. 6.